Gravy making intimidates a lot of cooks; when Myrna and I were teens, it was one of the first things taught in home economics cooking classes and at home. Gravy isn't difficult, and is so much better than anything you can buy. It's a perfect way to serve all of the goodness from your meat or poultry. I like to save the fat from the meat or poultry to use to make the gravy, it has a lot of the flavor. I also like to add a tablespoon of sherry to chicken gravies and brandy to beef gravies. A little white worcestershire sauce for chicken (now called marinade for chicken from Lea and Perrins) and regular worcestershire sauce for beef adds some flavor too, as do seasonings in the broth from the stew or roast. For caramelized richness, use carrot liquid in beef gravies whether it's from the carrots cooked with a pot roast or drained from canned or cooked carrots. Don't pour that liquid down the drain, save it in the freezer for gravy-making. Kettle gravy is made from the liquid in which pot roasts and stew have been simmered. Remember, the less liquid you use, the richer the flavor will be. Remove meat to platter. Keep warm. Skim excess fat from the broth. Pour off the broth and measure the amount needed and return to the kettle. Shake the flour together in a covered jar, or whisk it together in a measuring cup. Remember to always put the water in first and the flour on top for a smooth mixture. Whisk the flour and water slowly into the hot, seasoned broth. Bring to a boil. Cook 1 minute until thickened. *Cornstarch makes a clearer, more transparent gravy. Pan gravy is made from the drippings left from cooking roasts, steaks, chops and roasted or fried chicken or turkey. For improved flavor, cook the meat with or add some of these seasonings: bay leaf, pepper, onion, garlic, celery salt or Worcestershire sauce. Remove meat or poultry to warm place. Pour off fat; measure amount needed back into pan. Keep those rich bits of meat or poultry in the bottom of the pan. Add level tablespoons of flour. Use equal amounts of fat and flour. Stir fat and flour together until smooth, and then cook over low heat, stirring steadily until it’s bubbly and brown. Take from heat, stir in liquid slowly. A whisk is handy here. Always measure liquid, too much weakens the flavor and makes it too thin. Return the pan to the heat, stirring and scraping the rich drippings. Boil 1 minute, taste, season and serve. Remember that purchased broth, consommé or bouillon add a lot of salt and you may not need any more. 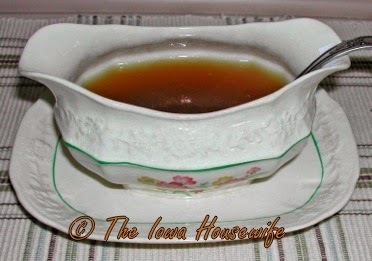 *Brandy or sherry will add richness to gravy, a tablespoon per cup can be added to the drippings left in the pan to deglaze it before adding the flour and fat. I use brandy for beef gravy and sherry for pork or poultry. If you want a good, homemade mix try this one from Myrna. When Sue wanted to use the Make-a-Mix book, I really thought I wouldn’t find much that I wanted to make. However - I was wrong. 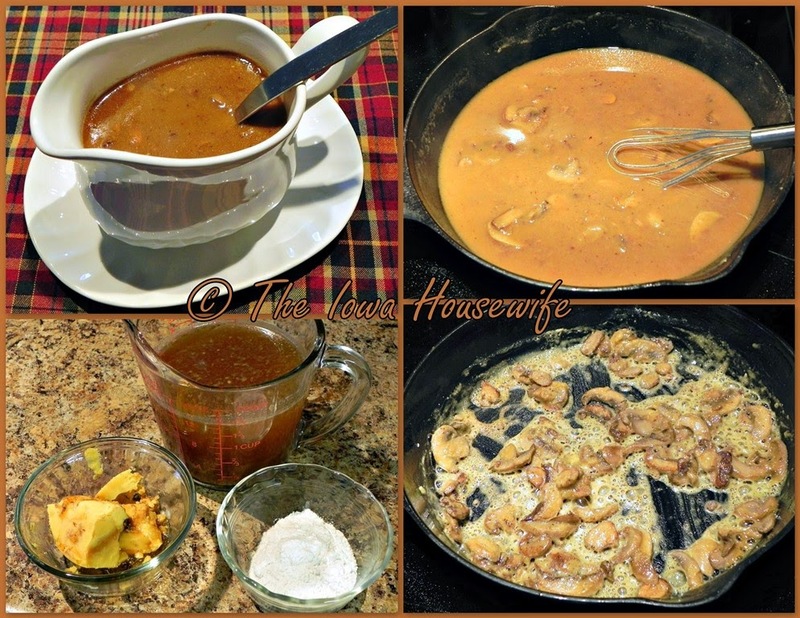 One of the recipes I tried and that we like and I will now keep on hand was this recipe for Chicken Gravy Mix. I only made ⅔ of the recipe so that we would use it up in the allotted time. If you have a larger family I would make the full recipe. You can use it for gravy or in a casserole or as a cream sauce with perhaps mushrooms and chicken. I am going to give you the directions for the full amount and the instructions to make plain gravy with it. This will be a cream type of gravy as there is powdered milk in the mix. Hope you enjoy it. I just want to add to this post, that both Lyle and Bettie thought it was great and I now use it often. Combine milk powder, flour, bouillon granules, sage, thyme and pepper. Stir with a wire whisk until blended. Use a pastry blender or two knives to cut in butter until evenly distributed. Spoon into a 3 cup container with a tight fitting lid. Label with date and contents. Store in refrigerator. Use within 4 to 6 weeks. Makes about 2 ⅔ cups chicken gravy mix. I used my blender to make this. Mixed the ingredients (no sage as we don’t like it) and then added the cold butter in small pieces till cut up finely. Worked great. Try different seasonings if you like. ½ cup chicken gravy mix. Pour water into pan. Use a whisk to stir the gravy mix into water. Stir constantly over medium heat until gravy is smooth and slightly thickened, 2 to 3 minutes. Makes about 1 cup. You two are SUCH good cooks!